Some years ago, my brother Phil, unmarried at the time, took over production of la vigilia di natale, the Italian Christmas Eve feast of seven (or 12) fishes. He managed to recreate nearly every delicacy — except eel — from my grandmother’s holiday repertoire while famously forgetting a few basics — plates, napkins and flatware. A few years later, along came Jodi who civilized the occasion with a tablecloth, napkins and utensils. Around that ever-lengthening table, year after year, new spouses, new babies and new traditions joined the memories our grandparents brought with them from Italy. My kids initiate the rookies with gentle jokes; the vegetarians added “no-face” dishes to the menu, and one year we simplified gift giving with a swap that Gramps dubbed “The Alaskan Trade-Off.” The family patriarch, who always calls things as he sees them, couldn’t come to terms with calling it a “Yankee swap,” and so dubbed it for the wintry 49th state. Often we can guess who bought a wrapped gift … Gramps favors power tools; one brother buys sports memorabilia while the other often contributes musical gifts; a cousin gives stationary and stamps. I’ve been known to wrap up a cookbook. 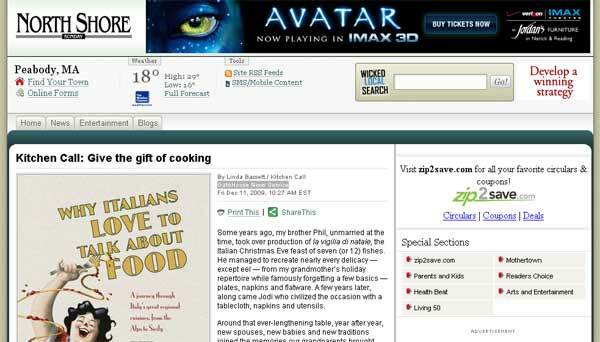 How about that segue into a list of cookbooks for holiday giving? The books here are cook-friendly rather than flashy and include newly published books, old favorites still in print, and others by local chefs who do not appear on the Food Network. Check both independent and chain bookstores for cookbook signing events to make the gift even more special. · “Why Italians Love To Talk About Food” by Elena Kostioukovitch. If you’ve ever sat at the dinner table with someone of Italian ancestry, you may have noticed a distinctly Italian trait: They will reminisce about past meals or plan future ones while thoroughly enjoying the food currently on the table. Italians, men and women alike, treat food in conversation like movies, books or sports. The newly translated Perché agli italiani piace parlare del cibo explains this through the customs, literature, folklore and traditions surrounding Italy’s most well-loved dishes. She uses regional specialties like the panzanella (Tuscan bread and tomato salad) and arancini (Sicilian street food) to deliciously illustrate differences in taste, language, and attitude among Sicilians, Venetians, Sardinians and Neapolitans. · “The Country Cooking of Ireland” by Colman Andrews. Ireland is exporting a new generation of firebrands — young chefs shaking up “old school” cooking. In this gorgeously photographed book, they highlight the country’s best products from the luscious green countryside, using them in classic recipes, like colcannon and boxty, and stylish innovations like a soufflé made with farmhouse cheddar.